Really? if i want to go see the team in action I have to get up before a retired guy's Dawn? What? The sun isn't even up. Do they use floodlights? 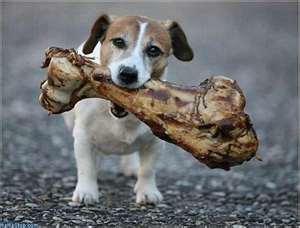 PurpleGeezer wrote: Really? if i want to go see the team in action I have to get up before a retired guy's Dawn? Totally agree! I watched them on Vancouver Lake in late October and it was too dark to even get a good picture. If they want us to get up at that crazy hour there had better be breakfast-burritos and champagne served like when we're hot air ballooning. Should be interesting to see them slalom around all the salmon fishermen. up7587 wrote: Should be interesting to see them slalom around all the salmon fishermen. You mean without slamming them into the sludgy slough? It’s not that often I see an article about women’s rowing/crew, so when I saw one that quoted UP women’s rowing Coach Bill Zack AND the headline mentioned women’s shirts, it piqued my interest. The article is way too complicated for me, but it’s exactly the kind of article the Geez would like, AND it’s from the New York Times, Geez. I vote the article and three others I linked to him the stupidest article on the NCAA. Nowhere does it tell you what rule it is so you can look it up yourself. And Nogera seems very confused between betting shirts and exchanging shirts. Two very different concepts. For the record, I have been to college women's Rugby matches where they bet shirts.part of the fun was getting the other team to take their shirts off. And Bill Zack has been involved in regional crew affairs for years. He is the perfect guy to start a program. And Jack Avina admitted to paying for a kid's tip home for a funeral. He said he didn't care what the rule was. PurpleGeezer wrote: I vote the article and three others I linked to him the stupidest article on the NCAA. Nowhere does it tell you what rule it is so you can look it up yourself. And Nogera seems very confused between betting shirts and exchanging shirts. Two very different concepts. I was hoping you would say that because I was totally baffled by the article. I grew up (soccer wise) in the UK, where the exchange of shirts was a given. I think NOgera is writing purely to see his own words, not for the readers! but wait a minute, when they actually tell you what is and isn't acceptable, there is this. So, if it traditional or a sports rivalry or a particular contest, you can do it, just as those College Presidents wager a case of Merlo for a truckload of Florida Oranges (yum). So, is it traditional? Is it done? Is it secret? Has anybody ever been busted for it? Yale and the other Ivys were the first schools to compete, and they did it first in this sport. It turns out Yale isn't at all shy about how their rowers bet shirts, and further, they out just about everyone else. So, if it is banned, these folks don't know. This could be the biggest betting scandal since the City College of New York got Busted. lets see... the Yale-Harvard Regatta started in 1843. that's 169 years of betting violations. I wonder if both schools will get the death penalty? maybe the Yale president will suffer Nathan Hale's fate. Since the fall of the professional oarsman in the late 19th century, American rowing has survived only as an unpopular amateur sport, carried on by a small groups of fervent, oft-ignored devotees. In “The Amateurs,” perhaps the most professionally rendered recent account of competitive rowing, David Halberstam emphasizes the amateur nature of competitive rowing. Back in the day, he says, oarsman rowed “because they wanted to, for no reward other than the feeling itself.” And now, for true rowing enthusiasts and modern dissidents like Halberstam, the sport has come to embody a conservative aesthetic, he says — a charming, anachronistic curiosity. Shirt-racing, or shirt-betting, embodies this traditional aesthetic. Pre-eminent rowing collector-historian Tom Weil ’71 says losers were traditionally obliged to strip the racing shirts off their backs and hand them to their opponents on the water. The boats would pull together, shake hands, pass the shirts and push apart, with the losing crew rowing back to the dock shirtless. Today, generally speaking, crews pass shirts on the dock or on shore, tempering, at least somewhat, the humiliation of the defeat. The delay of the exchange has emerged in tandem with another variation on traditional shirt-racing, in which teams purchase cheaper shirts for trading purposes. This practice, according to Weil, was implemented by a savvy Athletics Department to deal with crews who were losing shirts every race, incurring a substantial cost to the University. Yale lightweight coach Andy Card, who rowed at Princeton in the late ’80s, recalls taking part in the tradition. “It was certainly established when I was around,” Card said. Presumably, shirt-racing is so old that no one remembers how it began, only romanticizing further the practice. But Weil suggests that the betting of shirts may have been introduced by a Syracuse crew in 1920, or even more recently than that. While Weil’s collection includes stories of shirt-racing dating back to the ’20s and ’30s, the collector has never seen an image of the practice before the ’60s. Weil further emphasized that one can be sure of shirt-racing’s 20th-century origins since, pre-1900, racing was done primarily without shirts. Today, shirt-racing remains largely confined to men’s collegiate rowing in the United States. Most current rowers, including Yale oarswoman Tess Gerrand ’10, attribute the gender discrepancy to the anti-gambling regulations of the NCAA. Women’s rowing is an NCAA sport, while men’s is not. But shirt-racing was never a part of women’s rowing, even before it became an NCAA sport in 1997. In a letter to the editor of The New York Times on June 10, 1997, Mary Gallagher, a female Princeton rower in the mid-1970s, claimed a lack of women’s shirt-racing resulted from economic constraints due to unequal funding for women’s athletics prior to Title IX. As for the exportation of shirt-racing, it seems the practice remains an exclusively American tradition. At international competitions, oarsmen often exchange uniforms and team gear regardless of the result, but actual shirt-betting does not occur. In American men’s collegiate rowing, shirt-racing happens primarily in the spring. Competitive rowers train all year, competing in the fall and spring. While in the fall rowers race 5K head races against the clock, the spring consists of side-by-side 2K races. A team’s typical spring rowing program includes a number of dual races, featuring one or two other crews in preparation for the championship regatta-style races in May and June. For Division I men’s rowing, these championship races are the Eastern Sprints and the Intercollegiate Rowing Association Championships (IRAs). The IRA is considered the national championship. Division I rowing schools compete in annual dual races in which shirt-racing is established tradition. Similarly, the championship regattas operate according to an unspoken winner-take-all arrangement. In these races, because of large number of competitors, competition is divided into heats, semifinals and finals. The winner of the “grand final” takes home all of the jerseys, including those of teams eliminated in earlier rounds. Thus, championship crews return to campus with piles of racing jerseys, sometimes as many as 25, which they are free to wear as emblems of conquest. While oarsmen don the gear of vanquished competitors with pride, the exchange itself is generally characterized by respect and humility. Yale lightweight freshman coach Joe Fallon ’06 describes shirt-racing as a time-honored practice. Lightweight rower Spencer Salovaara ’10 characterizes the shirt exchange as a civil completion to the race. “[It] operates according to an unwritten code of humility,” he said. Halberstam traces the respectful tone of the exchange to the sense of community that has developed in the insular world of rowing, in part due to the intense physical demands of the sport. To an outsider, the civility of the exchange might disguise the intensity of the competition, but many of the rowers interviewed said it merely reinforces it. “In a normal sport, if you lose, you can go hide yourself in the locker room. In this sport, you offer yourself up to the victors,” Salovarra notes. there are 4,720 hits on the same subject. I wonder if Nogera will get the Pulitzer for his article? 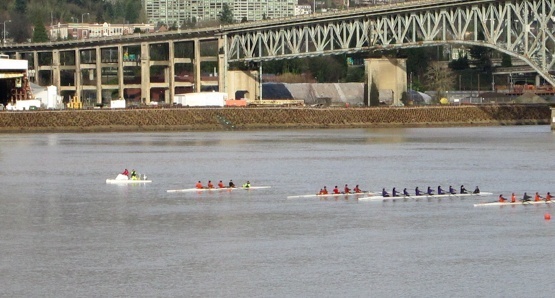 The Portland Pilots women's rowing team will begin the 2012 spring season with a series of races against Lewis & Clark and a boat christening on Saturday morning near the Portland Boathouse on the east bank of the Willamette River. 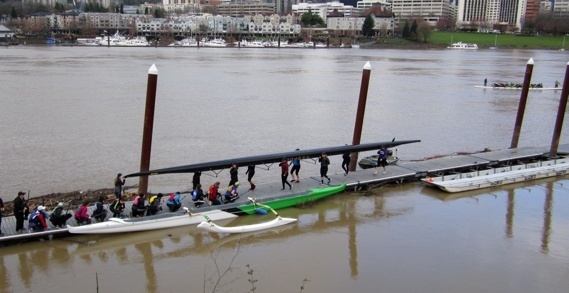 The race is scheduled to begin at 8:30 a.m., while the boat christening will take place at 10:30 a.m.
Saturday’s event against the Lewis & Clark Pioneers will feature four 1,000 meter “mini” races on the Willamette River. The starting line will be just south of the Ross Island Bridge, and the 1,000 meter course will run south down the Holgate Channel, finishing near the Ross Island Lagoon. The Pilots first eight will race against both the Lewis & Clark first eight and the Pioneers top men’s four. 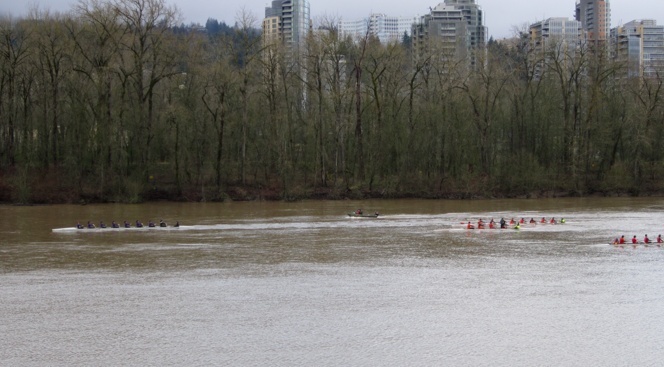 UP’s second and third eight’s will race Lewis & Clark’s second eight and a second men’s four. The meet will be followed by a boat christening and the naming of the two newest Pilot boats at the Portland Boathouse. 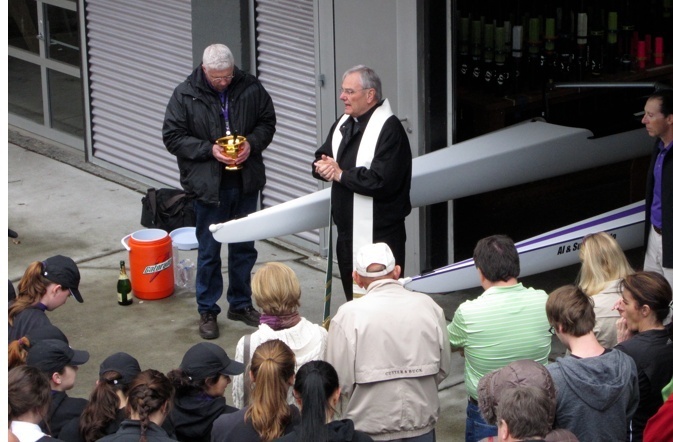 UP’s eight-person shell will be named ‘Fr. Bill’ in honor of University President, Rev. E. William Beauchamp, C.S.C., while the four-person shell will be named ‘Al and Sue Corrado’ in honor of the Life Regents and longtime supporters of UP athletics. Al Corrado is a class of ’55 alumnus. Zack noted that UP’s co-captains will express the team’s appreciation during the christening ceremony. The Portland Boathouse is located on the east bank of the Willamette River at the east end of the Hawthorne Bridge, just north of OMSI. There's something very nuanced in the use of some of the terminology in this discussion. Watching the crew teams this morning was a lot of fun. There were several good viewing points from the Springwater trail where you could see almost the whole Sprint course. i took my bike so I could follow along quite nicely since the trees haven't filled out yet. results were about as expected. The UP #1 boat was clearly the fastest boat on the water, and the Women's #2 boat won all its heats. the #3 boat had good and bad heats, but when they were in sync, they looked pretty good and did come in second behind the #2 UP boat in the second heat. start of one of the heats for the first boats. the UP boat "Fr. Bill" is second from the right. 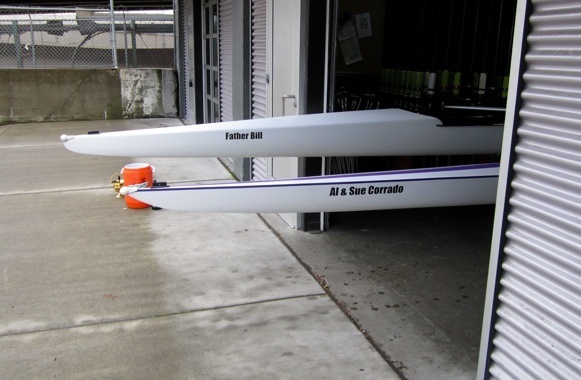 the Lewis & Clark Boat is on the right, and 2 L&C men's four oared boats are on the left. the #2 UP boat heading back downriver after a heat. no shirts were exchanged today. Hell, i wouldn't even have been willing to take off my parka. UP got 2 brand new boats which were christened today, which were given to the school through the generosity of the Corrados. the 8 oared boat has been Christened Fr. 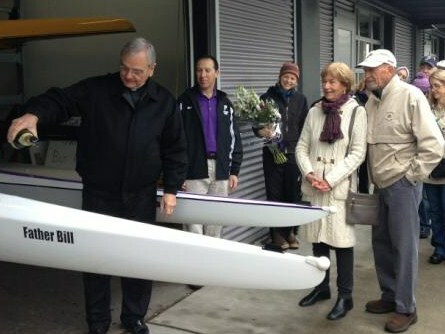 Bill, and the four oared shell has been named in Honor of Al And Sue Corrado. the 4 is configured for a bow coxwain. These carbon fiber beauties are a sight to behold. Coach Bill Zack saying a few words. Team members say some words. Father Bill spilling champaign on Fr. Bill. the Corrados followed suit with the boat named for them. Great report and great pictures, Geez. Thanks!! 5/12/2012 West Coast Conference Championships, Rancho Cordova, Calif.
Now that folks, is a short season. The Huskies only show 7 dates on their regular Spring season. All in time. All in time. We finally have the 3 eights and a four to compete in all classes. Adding this additional picture showing Al and Sue Corrado (and Fr. Bill) who have been so instrumental in the success of UP's athletic department and the entire student body. Everywhere you look, they have helped the university when their help was needed. I did get a dim shot of Al looking over the boats in the Boat House. Still learning how to use my new camera. Just so Al and Sue don't think their support was wasted, the students were pretty good at getting Father Bill (left, below) up the course, too. (here at about 500M) I forget which heat this was, but the results were pretty much the same each time. the L&C eight and the two men's fours are to the right. and to give you an idea how long these boats are, here is the "old" boat being taken back to the house, with the yellow third boat waiting its turn. 27 UP team members had fun. Maybe the next time I'll get a picture of the new four in action. the dragonboaters heading towards their boat had to duck down so they didn't get swept off the dock by the oar riggers. Lots of traffic on that dock. After having their best season ever last spring the Bainbridge Island high school crew team, which boasts a total of 106 athletes combined in the boys and girls team, looks to even out-do last season. Head coach Tom Goss said this is the first crop of seniors he has had. 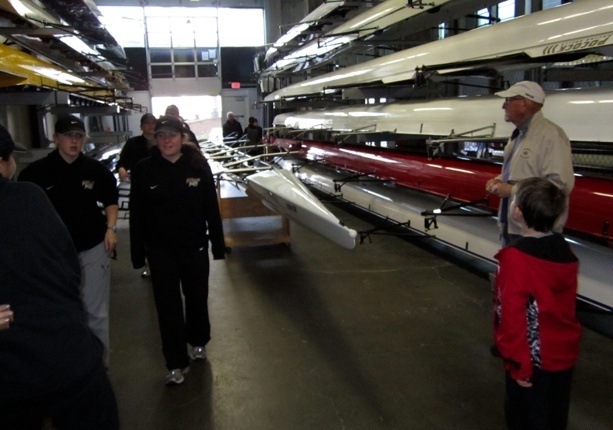 The team’s first regatta is Saturday, but only the novice riders will travel. 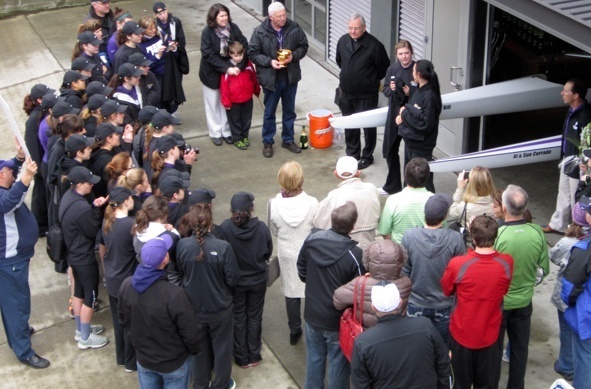 The varsity team’s first of three big regattas is on April 14-16 in Eugene, Ore., where both high school and college level teams will compete. The meets for the crew team all lead up to the Regional Championship Regatta at Vancouver Lake in mid-May, where Goss said he hopes to have a boat or two qualify for nationals, which takes place in Tennessee. It will take all eight riders to reach the goal of qualifying for nationals, but both the girls and boys have some exciting athletes to keep an eye on. For the girls, Bridget Sloat and Hannah Marsing are two of the team’s strongest riders. Both have said they are going to row at universities next year. Sloat plans to row for the University of Portland and Marsing plans to row for Bucknell. 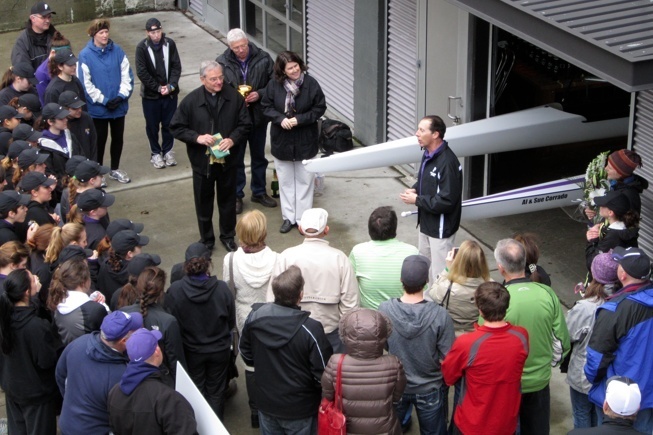 A: UP will also have their boats at the regattas in Eugene in April. B: Who knew they were called "riders?" It seems to me they work awfully hard to be simply "riders." DoubleDipper wrote: Who knew they were called "riders?" It seems to me they work awfully hard to be simply "riders." Sounds like a term an Army recruiter made up.
" Hey buddy, we're going to ride into Iraq. Wanna ride along?" 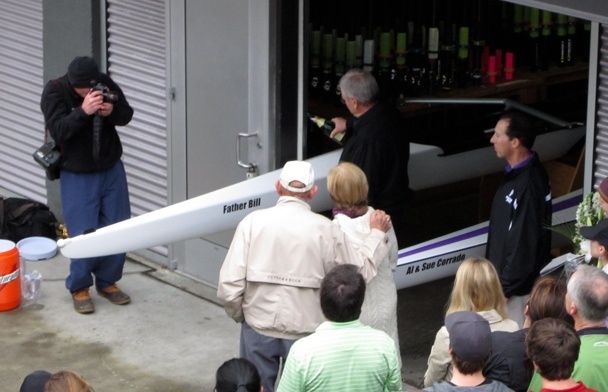 While UW sent its top three women's boats to San Diego for a regatta down there, they still had enough boats to give UP some competition at the Husky Open, which featured Men's boats from Brown and UW. I'm pretty sure this is the first time a UP Varsity team has actually raced at 2000 meters, or even gone through all the logistics at a regatta. The big news is that the brand new boat is unbeaten, as they won the varsity 4+. It was the first race of the day, so I bet they were pumped. Congrats on their first win. The Novice UP boat was only 4 seconds behind the UW boat, and the UP Varsity 8 came in behind the two UW boats. BTW, all three UW women's boats went trough to tomorrow's final in San Diego. 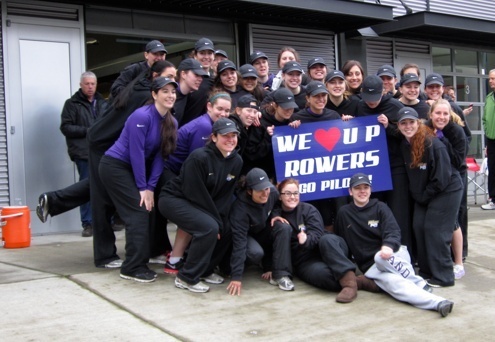 The Portland Pilots women’s rowing team traveled south Saturday for the Covered Bridge Regatta at Dexter Lake in Eugene. The first-year Pilots competed in six events against some well established programs and did very, very well. Gran resulto a partir de trabajo Duro. ¡ Aguante equipo de remo!